I'm interested in getting advice on the quickest (and most prudent) way to get into planetary imaging (mainly interested in Jupiter and Saturn). I'm just looking for acceptable results and my preference is to use what I have as much as possible to start. I've been imaging DSO's (unguided with a DSLR) for a couple years now. I have a Nikon D5300, GOTO Skyview Pro Mount, 6” F/5 reflector and Tele Vue 2x barlow. I’ve been reading up on all this so am familiar with “luck imaging”, stacking software etc. for planetary imaging. Option 1, Use my Nikon D5300: From what I’ve read using live view to capture video is not optimal with this camera so this may not be an acceptable option. I’d consider “eyepiece projection” but am guessing this may also not lead to acceptable results. Option 2, Buy an Astro camera: I’d like to keep this as inexpensive as possible. Maybe an ASI224MC or ASI290 and a 3x barlow? I say a 3x barlow because from what I’ve read, this gets me closer to the optimal focal ratio. However, I do wonder whether pushing my 750mm reflector to these focal lengths would work well. Maybe my existing 2x barlow would be good enough? Also, another consideration for choosing a camera is that dual usage for EAA or and/or as a guide camera would definitely be a bonus. I think "option 2" is the way to go. Video with a DSLR probably means a lot of image / video compression and related artifacts. The softwares are more geared towards data from these ASI and similar cameras. A 6" scope is small for planetary imaging. Most of the "nice" images I see start around 8" to 10". So you may want to up-size to an 8" / 10" / 11" SCT sometime. Probably an 8" SCT could easily ride on your existing mount. Edited by ngc7319_20, 17 April 2019 - 09:25 AM. I would go with option 2 and get something like a 290MC with a 3x barlow to get to an optimal focal ratio for maximum resolution. But you're starting down a slippery slope. Option 2 is definitely the way to go. The optimal focal ratio is 5 to 7 times the pixel size in microns. Certainly start with your 2x Barlow. Finding / centering / tracking will be easier. You can get pretty nice pictures of Jupiter and Saturn with a 6" scope. As far as added expenses go there is the ADC and Barlow already mentioned and you will also need an IR-cut filter. You may want to upgrade your hard drive to an SSD. Wow, thanks for all the great advice! Seems like "Option 2" is the way to go. Maybe I'll start with my 2x barlow and play with an extension tube before purchasing another barlow. I've never even heard of an ADC so I will look into it (one more thing to buy...thanks!). I also understand a larger scope would be better, but for now I'd like to just experiment with what I have. Hope I can adequately describe a lingering question I have. With regard to "optimal focal ratio" I don't have a good understanding on "trade-offs" and what is feasible with a 6" reflector. Is it really possible to use a 5x barlow with my 6" scope and a 1/3" sensor? Isn't this the visual equivalent of about 600 power? (I do realize there is no magnification, going on like in visual). Maybe "lucky imaging" accounts for this in that some images will be clear? Or, given I have a 6" scope, should I be more inclined to use a 3x barlow at f/14 and be satisfied with a smaller image? My photography experience tells me I will get a smaller brighter image with the later, but I'm not sure which would result in a clearer image. 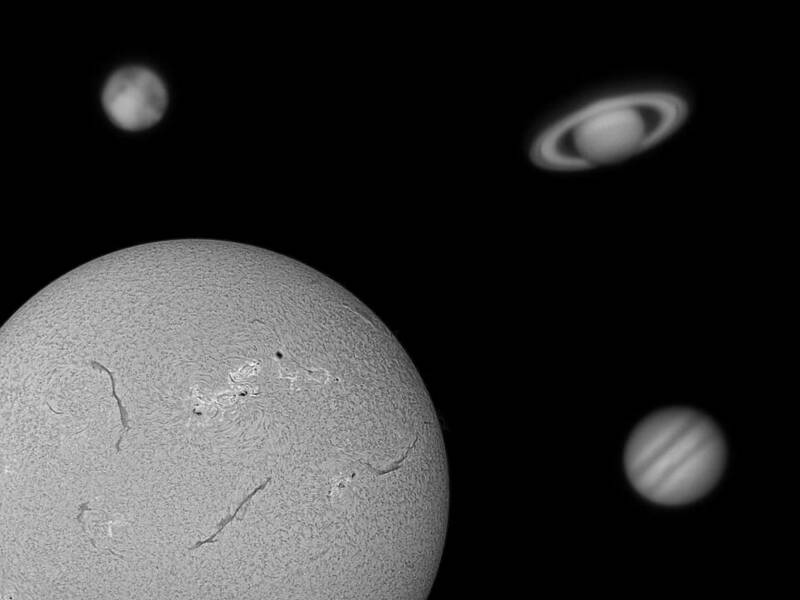 Maybe it all depends on seeing conditions which if good would allow me to use a more powerful barlow and get a larger, adequately sharp image? Hopefully I making some sense and any thoughts would be appreciated. Go to this page on my website and scroll down to the bottom. When using the optimal focal ratio the size of Jupiter in pixels will be the size of your scope in mm. A 6 inch scope is 150mm so Jupiter will be 150 pixels wide. When doing this you will have the same number of pixels of Jupiter no matter the pixel size. Each pixel with a camera with 1 micron pixels (f/5) will "see" the same area on the surface of Jupiter as a camera with 4 micron pixels (f/20) so with one camera each pixel will get the same amount of light as the corresponding pixel of the other camera.